A common requirement in content management systems, forums and portals is to track the number of times a file has been downloaded. Such a tracking gives you an idea as to how many users downloaded a file and thus can also hint at the popularity / usefulness of the content. One can always put a hyperlink directly pointing to the file that is to be downloaded. However, such direct links don't reveal any information about the number of times a file was downloaded. 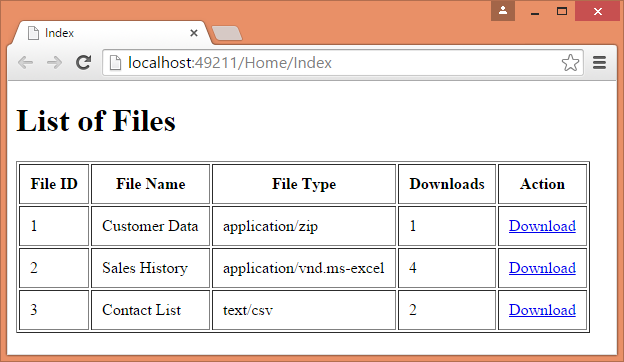 Luckily, with a little bit of coding you can track file downloads in ASP.NET MVC. Let's see how. The Files table has five columns - FileID, FileDisplayName, FilePath, FileType and DownloadCount. The FileID is an identity column. The FileDisplayName column contains a friendly name of a file that is displayed to the user. The FilePath column contains the ~ qualified virtual path of the file. This path is never shown to the end user. It is used by the action method internally (I will discuss this shortly). The FileType column holds the MIME content type for a file. This value is used while downloading the file. Finally, the DownloadCount column stores the number of times a file was downloaded. Notice the code marked in bold letters. The ActionLink() call points to DownloadFile() action method and passes FileID as a route parameter to this method. You will write this method shortly. The DownloadFile() method increments the DownloadCount column value and calls SaveChanges() to save the changes back to the database. It then computes a file name that is displayed in the "Save As" dialog. Notice how VirtualPathUtility class is used while forming the file name. This file name can be anything of your choice. I am using the name same as the FileDisplayName value. The DownloadFile() method returns a FilePathResult (instead of usual ActionResult). To wrap a file in FilePathResult and send it to the client you use File() method. The File() method takes three parameters - virtual path of the file, MIME type of the file and name to be displayed in the "Save As" dialog. 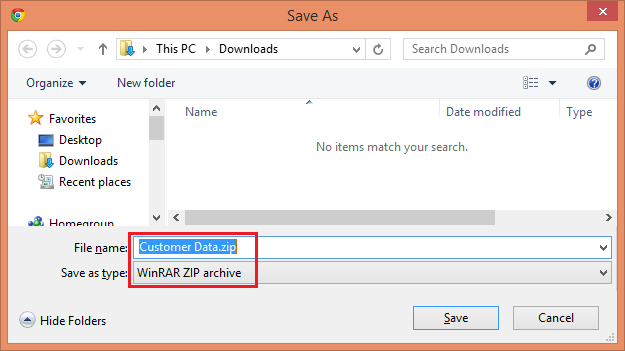 Notice that the "Save As" dialog is showing the file name as per the third parameter supplied to the File() method. There are a couple of more variations of the File() method. These variations basically allow you to alter the source of the file content. In the preceding example the source of file content was a physical disk file. What if a file is stored directly in the database as a binary (BLOB) data? Or what if a file is being generated programmatically on-the-fly based on some logic? The other two variations of File() cover these possibilities. Consider the following code that shows a DownloadBytes() action method. Here the file content is generated as a byte array (a more realistic case would be when a file is stored in the database). The byte array is then passed to the first parameter of File() method. Note that the return type of DownloadBytes() is FileContentResult. Now consider one more variation. Here the file is opened into a Stream using OpenRead() method (a more realistic case is when a file is generated on-the-fly on the server). The Stream is then passed to the first parameter of the File() method. Note that the return type of DownloadStream() is FileStreamResult.